From a young age, growing up in the Crittenden household, my brother Rollo and I were subject to many a dinner party. It was the eighties and the raucous laughter would waft up the stairs. Sunday morning would see us fossicking through the debris, ever hopeful we’d uncover an unnoticed after dinner mint. Perhaps you can relate. Mum, Margaret Crittenden, was known for the amazing food she was able to whip up in the kitchen whilst the wine Dad was making from his newly planted vines would complement the dishes beautifully. The perfect team. 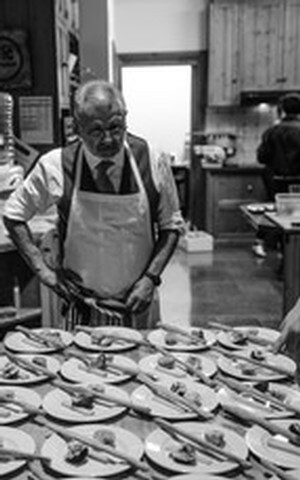 Perhaps that’s why, 35 years on, events and dinners at Crittenden Estate are such an important part of what we do. Rollo and I, having grown up with it, simply love to entertain. Many appreciate the emotive influence that food and wine has in our lives. Often shared with those we love it has the power to evoke an array of senses. On March 16th, guests were treated to an event that surmises all that we do here at Crittenden – create an amazing experience for our guests. 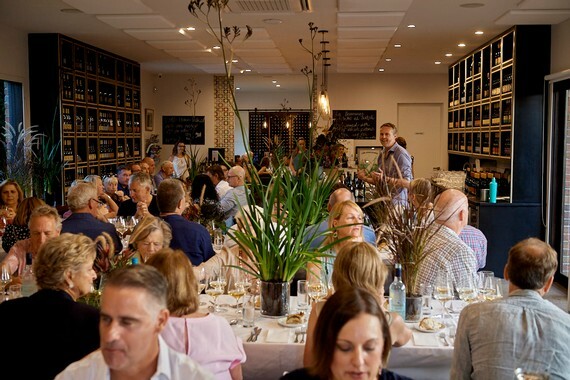 As part of The Melbourne Food and Wine Festival we teamed up with Guy Mirabella from ShopAte in Mount Eliza to create not just a dinner but an experience for those who attended. We called it The Cook and The Winemaker. Guy and his food is an institution on the Peninsula. His cooking is superb. But more than that, Guy is creative and artistic; evident in the food he prepares. We knew he would be the perfect partner to take this dinner to the next level. 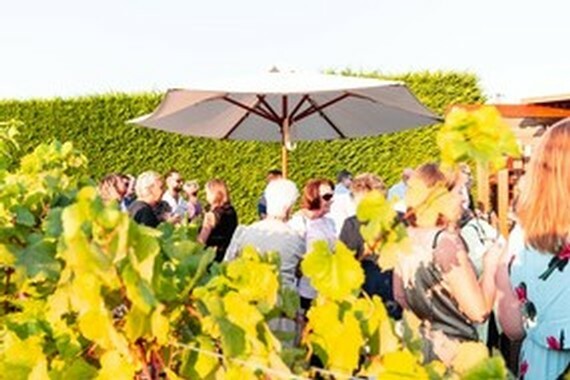 In the thick of harvest guests were able to witness vintage in real time. 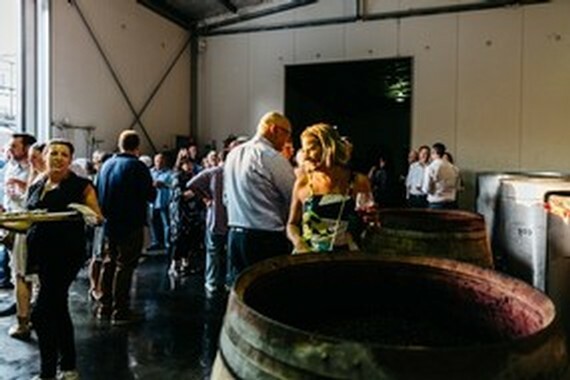 The evening commenced in the winery with a cocktail made from local Bass & Flinders gin along with Pinot Noir “grape must”, fresh from this year’s crush. 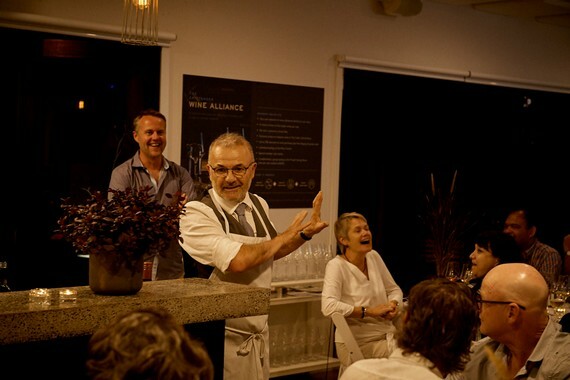 Developing relationships is fundamental between nature, the winemaker and the cook. These threads were entwined on the night and guests were treated to an artistic and sensory feast. Music, chosen by Guy, introduced each course and menus were quirkily crunched in a ball at place settings. The wine was carefully matched and flowed in abundance; nine premium wines, three of these sneak peaks into wines not yet released. Events at Crittenden are an important part of what we do, although they are but one component of the experiences those who are a part of the broader Crittenden family can enjoy. Perhaps after reading this you’re lamenting that you missed out. Please don’t, there will be more. Stay tuned to our website to keep up to date with the events that we do here and in the meantime, come and enjoy some of the other experiences on offer at Crittenden. Our custom built Wine Centre offers seated tastings in comfort where you can discover the vast array of styles we offer. This, we believe, is an experience in and of itself. The Crittenden Wine Centre is open daily from 10:30 until 4:30 and we look forward to welcoming you. The basis for any solid solution.. start at the root of the problem and work your way up. This is the exact approach of the Crittenden family who have found fruit in their holistic approach to vine health. After 25 years of “conventional” farming – relying on the use of synthetic chemicals to manage the vineyard – started to take its toll of the quality of their grapes they found themselves digging in the dirt for a more traditional approach. 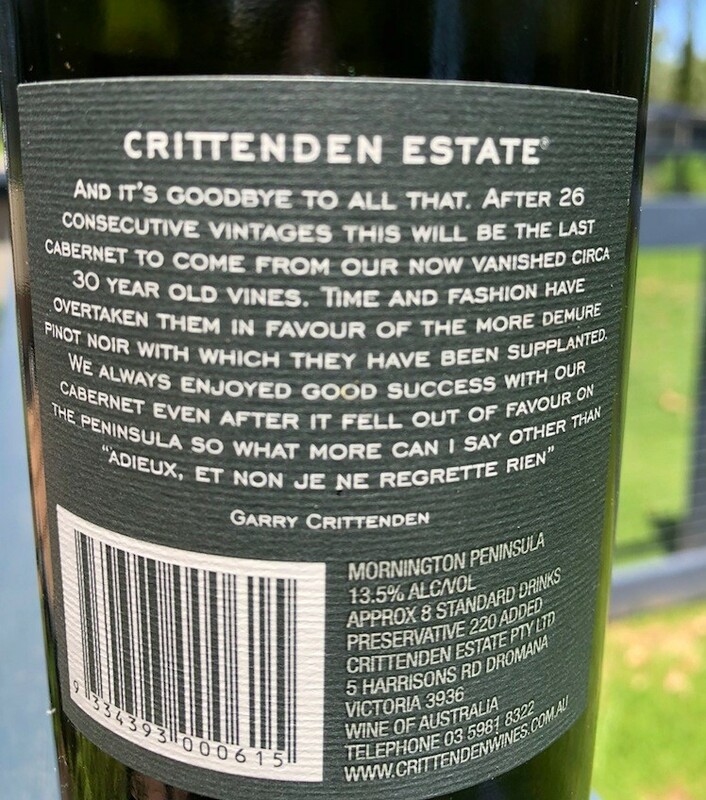 By the early 2000’s the Crittenden family, with viticulturalist father Garry at the helm had noticed a year on year increase in the amount of time on the vine that their grapes needed to achieve flavour ripeness. 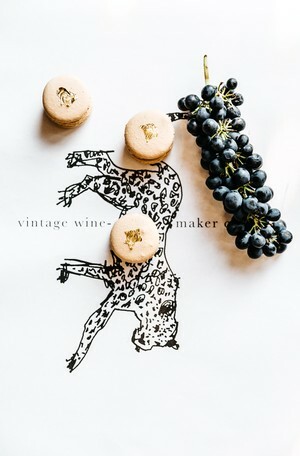 All the while the grapes were gaining excessive sugar and dropping vital acidity, which threatened to throw their resulting wines out of balance. 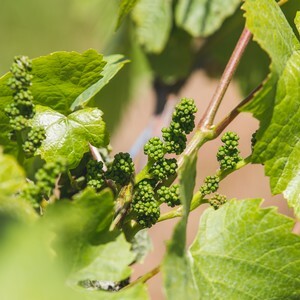 Vines of increasing age are usually prized as they can often produce lower quantities of higher flavour concentrated, better quality fruit. However at the vineyard, just outside Dromana, the reverse was becoming apparent. Faced with this paradox they started researching alternative methods to promote the health of their vines. And so began the journey underground, using organic viticulture techniques, which represented a return to the traditional way of doing things before farming became concerned with quick and easy chemical solutions. 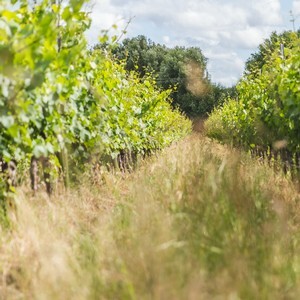 By 2008 the philosophy became about eradicating synthetic pesticides, herbicides and fertilisers in favour of natural preparations to deter pests, and also having home produced compost, made using winery waste. 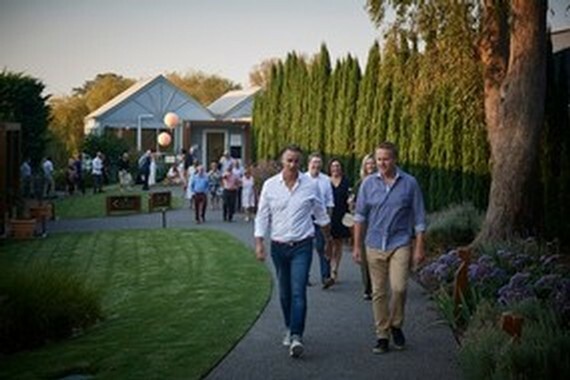 Crittenden Estate now finds itself at the forefront of soil health in viticulture in Australia. This may sound like proverbial horse poo but that’s actually, in reality, only very small part of it. 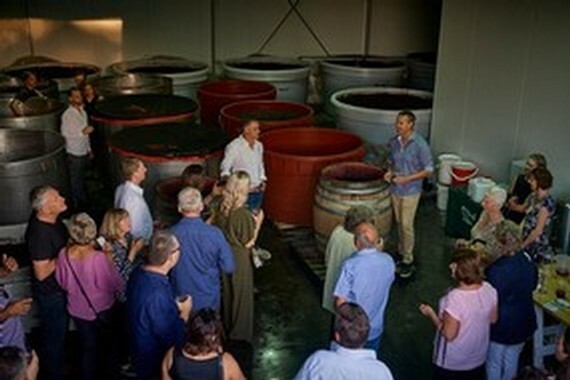 The winery produces about 60 tonnes of “marc” every year as a by-product of winemaking. Simply put marc is the sticky mixture of grape skins and seeds that’s left after pressing. 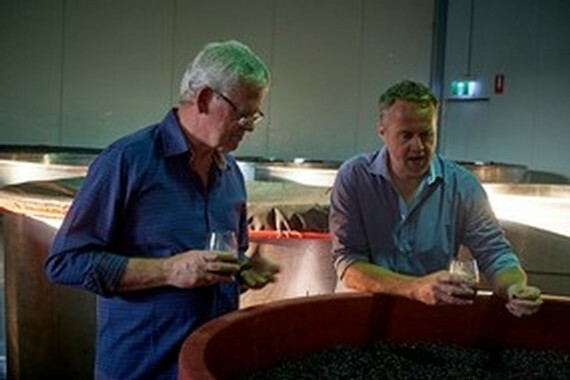 One tonne of grapes can provide between 200-250kg of marc, so for a winery like Crittenden Estate – who process between 200-250 tonnes of fruit a year – it represents a pretty significant quantity of waste material. However this by- product is also rich in nitrogen, magnesium and other elements that are essential to organic farming, so a huge component of high quality fertiliser is already on-site. 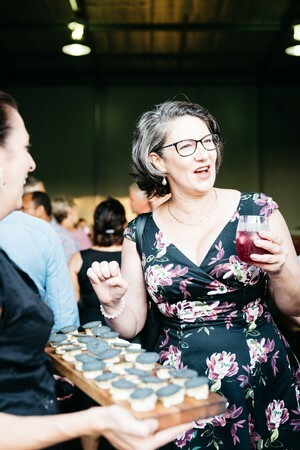 While most wineries will pay to have it taken away, the Crittenden family are reaping the rewards of working with this nutrient rich residue, so much so that they have started taking it from other local wineries as well. The marc is collected straight from the presses in the winery and tipped into a skip on site; once filled, the skip is then moved to another part of the property where it is mixed with locally sourced horse manure and straw or wood chips. 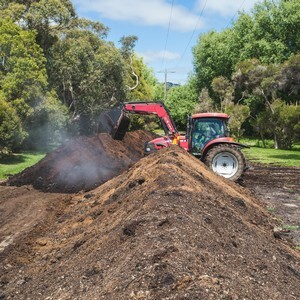 This pile is turned once a month by a digger, aerating it to promote the ferment of good bacteria. 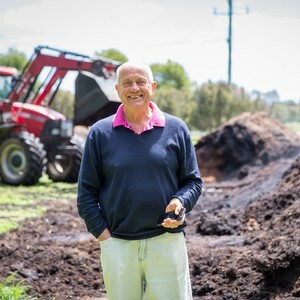 Winemaker Rollo Crittenden knows that there’s no way they’d ever be able to buy in this amount of compost (the amount of marc they now receive is the result of some 1000 tonnes of processed grapes in total) but that it has now become a vital ingredient in the surge in soil and resultant vine health in the vineyard. The steps involved have without doubt increased the work load on the estate. 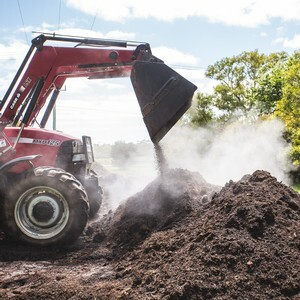 There is the capturing, turning and then finally spreading of the manure on the eleven acre vineyard block on the property but Rollo says it has become a race to the top rather than to the bottom. “We feel that this is an investment in the future. It does mean that the cost of our production goes up but so does the quality, and that’s where the investment is”. The steps towards soil health also involve growing more diverse plant life than just grapes in the vineyard. Cover crops such as peas, oats and broad beans are planted between the rows as they help fix nitrogen in the soil and increase its bio mass. For the hotter summer months this is then rolled flat to trap moisture in the soil, and as it dies off, it renourishes the growing environment in the ground below. 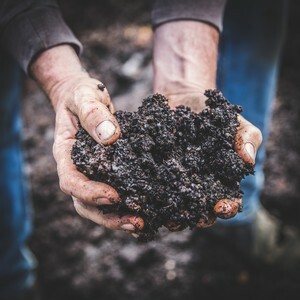 In an endeavor to map the leaps in quality of vineyard health, Crittenden Estate are now heavily involved in researching and quantifying the positive effects that the compost and cover crops introduce, and are an internationally recognised forerunner in this field. If the technical details are tough to digest, there is one simple takeout from all of this that’s easily understood, and that’s the enormous environmental benefit. 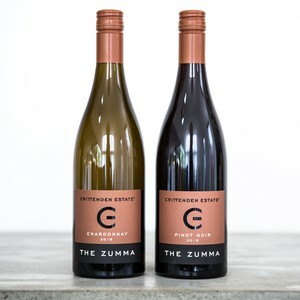 In a time when everyone is thinking local, Crittenden Estate are not only protecting their immediate ecosystem by ditching chemical farming but they are giving back to the very earth that grows their grapes. What’s more these healthy soils require a fraction of the irrigation they once did. 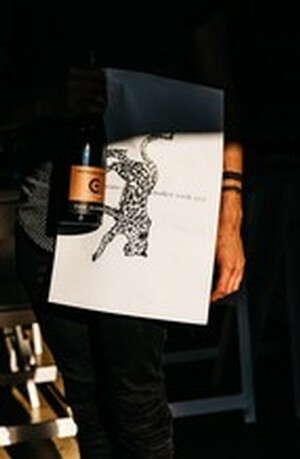 The accolades are steadily stacking up for the Estate’s wines and there can be no doubt that this is due in no small part to the radical shift back to these traditional farming techniques. … or so Rollo says.